Phenori also called as Sweet Satta is a sweet dish prepared during special occasions specially during Diwali. My mom always used to prepare it during Diwali and we kids used to finish all within a week. Personally, I am not a sweet lover but I can't stop eating Phenori. They are so yum, crispy and tasty. The procedure to prepare it looks difficult but is really not so. Try preparing little at first so that you get an idea how it tastes or how much difficult it is. Sugar Syrup can be used instead of Sugar powder. Phenori should be fried properly else they will become soft. You can sprinkle chiroti rawa or rice flour to make them crispy. Roll from center to the side. All the layers should be clearly visible. And avoid the centre from getting thin. The number of layers can be 3,5 or 7. The oil/ghee to fry should be medium hot and not too hot. Powder the Sugar along with Cardamom and keep it aside for coating. Knead together Maida along with ghee and sufficient amount of water to make a hard dough similar to that of a consistency of a puri. Allow the dough to rest for an hour or two by covering it with a wet cloth or closed container. Pinch dough into small balls and roll into thin puris by dipping in maida. Take 5 puris. Apply some ghee and sprinke 1/2 tbsp of rice flour / chiroti rawa on first puri. Place the next one 1 inches from the edge of the first one, so as the second one will cover 2-3 part of the first puri. Repeat the same for all the other puris. Once all the 5 puris are placed one over the other, gently but firmly roll the first puri's edge inwards and roll it until it reaches the last one. Gently press along the rolled in puris to avoid any open ends. Cut the roll into 1/2 inch pieces with a sharp knife. Press the cut pieces slightly and roll it again. Heat Oil / ghee and deep fry all the rolled phenori on both sides until crispy and its color changes to light brown. Take out of oil. Cool for few seconds. 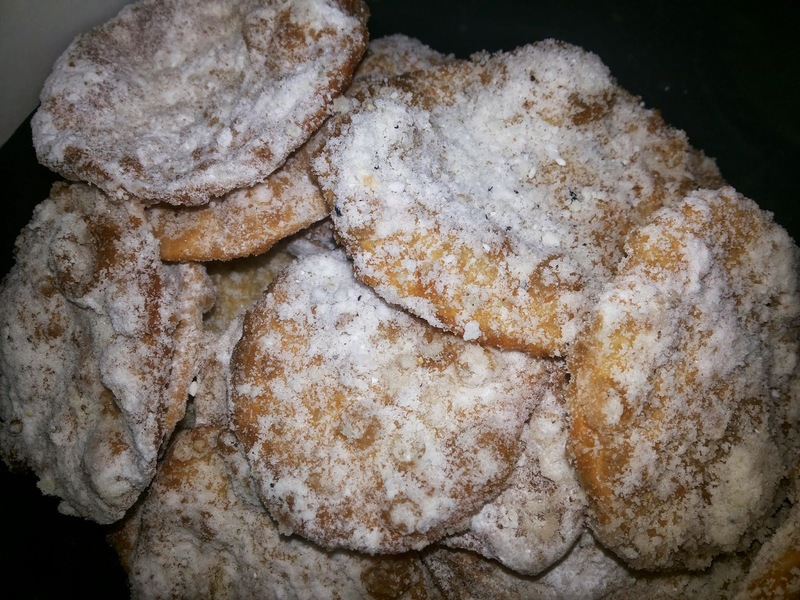 Dip in sugar and cardamom powder mix. Serve once cooled or store in an airtight container.